We’d been married less than 10 years when we bought this old house on Mahncke Park, but our cookbook collection was already big enough to demand its own built-in bookcase in the kitchen. Each of the books has a story, which kind of explains why this librarian’s daughter thought it made sense to house Like Water for Chocolate on the top shelf, along with the other Mexican cookbooks. The one I opened today is A Taste of San Francisco, published in 1990, a dog-eared testament to the nearly four years we spent living in El Cerrito and commuting to work in San Francisco. The newspaper wages were so low then, relative to the cost of living, that we could only afford to go out to eat about four times a year. What I could afford was to cook my way through the book, learning the great restaurants and the works of 80 Bay Area chefs through the pages of the “culinary variety show” compiled by the San Francisco Symphony. Today, as it has done many times before, the book falls open by itself to the very well-loved page 214, which has a recipe for Gazpacho from talk show host Narsai David, of KCBS Saturday Kitchen fame. The photo here is from another hot summer day four years ago, when I gathered the Gazpacho ingredients on the kitchen counter and realized that both the components and the soup are art — as easy on the eyes as they are on the tongue. 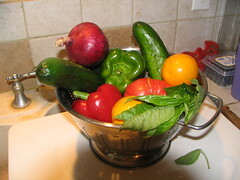 Finely chop 1/2 cup of each of the cucumber, onion, bell pepper and tomato and place in a soup tureen. Place remaining cucumber, onion, bell pepper and tomato in a blender or food processor. Add garlic and basil. Add as much of the clam juice or stock as needed to obtain a smooth puree; add to the soup tureen. Stir in vinegar, oil, tomato sauce and orange juice. Season with hot sauce to taste. Add orange zest. Cover tureen and refrigerate for 2 or 3 hours to let flavors marry. * Place avocado half in soup bowl, spoon shrimp into the cavity where the seed was, then ladle Gazpacho around and over the avocado.